You’re going out on your evening jog when suddenly, one of your steps doesn’t quite land properly. You’re walking to the train station, eyes glued to your phone and you trip into a pothole on the footpath. You might even simply lose balance while popping down to the shops for some coffee! Each of these accidents can easily result in an ankle sprain if you don’t land properly. 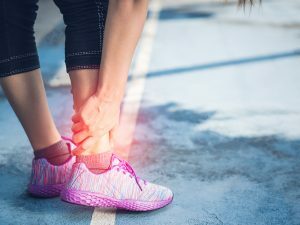 If you’ve suffered from an ankle sprain in the last couple of months, you’re not alone – it’s estimated that 25,000 people suffer from sprains every single day in the US alone. Of course, if you’ve recently suffered from a sprain you’re probably not interested in learning how common sprains are on a given day. No, what you want to hear about is sprained ankle recovery! When we think about our joints, most of us think about bones, cartilage, and sockets. Few of us give much thought to our ligaments. Long story short, ligaments are short bands of tough, fibrous tissue that connect bones and cartilage to form a joint. If your ankle joint was a piece of furniture, then ligaments would be the nails and glue that hold the wooden frame together. And when you roll, twist or otherwise turn your ankle beyond its normal range of motion, you put unnecessary pressure on your ligaments, resulting in damage and even complete tears! The result? An ankle sprain. Sometimes the worst pain subsides after an hour, leaving you with light to moderate pain for the next couple of days. Other times, it can completely ruin your ability to walk for the next couple of months! So what’s the deal with ankle sprains? Results in mild tenderness, swelling and stiffness. The ankle feels stable, and you can more-or-less walk in most cases with relatively minimal pain. Fortunately however, the vast majority of grade 1 sprains only result in minimal impairment. You’ll still be able to walk and in most cases, your ankle will take your weight – that said, we don’t recommend pushing it any further! In most cases of mild sprains, patients can expect a full unimpeded range of movement again in 2-3 weeks, though it can take up to six for the damage to your ligaments to completely heal. A sprain graduates to grade 2 when it results in a physical tear in your ligaments. Unlike grade 1 sprained ankles which are relatively unobtrusive, grade 2 sprains result in moderate functional impairment. Grade 2 sprains generally result in moderate pain, swelling and bruising. In most cases, walking for extended periods is painful. Furthermore, they come with a recovery period of approximately 6 weeks. Grade 3 sprains refer to a complete break in the affected ligament(s), and usually come with a side order of severe swelling and bruising. Don’t expect to be walking anywhere – ankles suffering from grade 3 sprains are unstable and often can’t support your body weight without intense pain. How long does a grade 3 sprain to recover? Often, this one’s difficult to answer. While grade 3 sprains generally take anywhere between 6-12 weeks, the exact recovery time will depend on the nature of your specific injury. It can take weeks for your ligaments to fully recover. During this time period, you should be aiming to prevent poorly-formed scars that’ll just tear again in the future. Regaining strength, movement and proprioception (knowing how to orientate the body in space) is critical to avoid becoming one of those ‘recurring ankle-sprainers’. Fortunately, your sprained Physio for ankle is an expert in just that – they will prescribe a tailored routine of exercises and mobilisations that gradually accustom you to ankle use and restore a full range of motion. One of the biggest risk factors in spraining your ankle again is a past sprain. Strength training can tighten up your ligaments, reducing your risk of recurrence. This is a key component because after a sprain, your muscles don’t just have to do their ordinary job of moving the limb, they also have to take up some of the slack left by the sprained ligaments and help with joint stability. Your physio can also prescribe tools to deal with grade 2 and 3 sprains. Tools like casts, braces or walking boots in really bad cases can reduce the pressure on the affected ankle and minimise your risk of making things worse. In most cases though they’re not necessary. Finally, for athletes a physiotherapist will help you return to sport by prescribing sport-specific exercises and a progressive training regime to enable an injury-free return to your favourite sport. Get back on your feet… literally! At Physio AUS, ankle sprains are without a doubt one of the most common conditions people see us for. You don’t even have to be a pro athlete to suffer from a sprain – anyone can suffer from an ankle sprain. Book an online or physical consultation today! Is your sprained ankle stopping you from making a physical session? Our online consultations allow you to get professional treatment without leaving your home or office! Book an online consultation today. Located near our Caulfield South clinic? Book a consultation with our team of skilled physios.